This entry was posted on February 11, 2015, in NME. Bookmark the permalink. 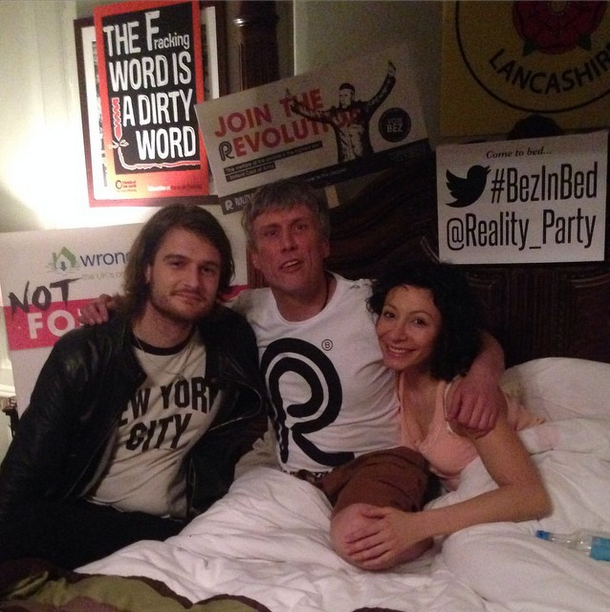 Bez and his girlfriend Firouzeh Razavi have begun their week-long ‘bed-in’ protest which intends to raise awareness of the UK anti-fracking movement. The protest, inspired by John Lennon and Yoko Ono’s two anti-Vietnam war protests in 1969, has the support of Ono herself. In 2013 she penned the anti-fracking anthem ‘Don’t Frack My Mother’, which was performed by her son Sean Lennon.